Chris Dwiggins was not an employee of S.O. Tech, but this company would not have reached its status without his support, insight and friendship. He was more than just a comrade, instructor, and friend: to many of us he was a hero. He led his life in a way that inspired us as soldiers, businessmen, and citizens. A quiet professional and consummate warrior, Chris' jump boots have made this world a more secure place for countless people who will never know his name, know who he was or what he did for them. His boots will be hard to fill. As a friend in business, Chris helped us out not for personal fame or monetary benefit, but because he wanted to see the best gear built for servicemen who needed it. Despite all of the free advice and support he gave us, he refused to pay anything but full price for gear. Once, when we made a mistake on a project we sent to Gunsite, Chris and Leah corrected the problems on their home sewing machine, overnight, before passing the product on to the recipient. When we talked about how well the business was doing, it was never in terms of dollar signs but in terms of how many soldiers we equipped. As people, we could all learn something from Chris' devotion to his country, its people, and the oppressed masses around the world. As long as I knew him, I cannot remember a project that Chris was involved in that wasn't based on community service. It was only after he was gone that I realized that the young soldiers I was training, I was molding to be NCOs in his image. Whether he was defending human rights as a SF soldier, saving lives as a nurse, protecting citizens as a reserve deputy, or teaching wilderness medicine to college students, Chris lived his life always acting in benefit of others. We will all miss him greatly. Godspeed, Chris. Additional: There is a memorial in the SOTech office hall. It’s a picture of Chris and a ratty old nylon bag. We made numerous repairs over the years to that bag. Sometimes it carried a computer and files, and sometimes it carried an MP-5K. But more importantly it carried Chris’s good ju-ju. We think it still brings us luck at SOTech. When I started my company 20 years ago, there were three amazing men who mentored me, supported me, and inspired my designs. They were Chris Dwiggins, Ben Lennett and Pat Rogers. I smile remembering meet ups at Gunsite (a shooting training center in Prescott, AZ) of the four of us talking over SOTech's newest designs. These were not just SOTech's hallmark designs, but every SOCOM member got issued an IFAK derived from these designs, and tens of thousands of troops and Marines were issued a chest rig derived from those early designs. Those early days inspired me and they drove me. Chris died about 10 years ago, Ben died about 2 years ago, and now Pat is gone. There were three great men in that circle, and one guy who was just lucky to be there. It was an honor to have had the opportunity to embed their ideas in some good gear that has saved so many lives. The SOTECH and VIPER / Veterans Industry Program for Employment Reintegration family mourn the tragic and sudden loss of one of their leaders and greatest inspirations, Darrell Rolen. 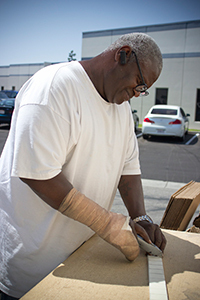 After experiencing severe PTSD from surviving two shipboard fires, Darrell lived 20 years homeless on the streets of Los Angeles, including 5 years living under a bridge next to the Good Year blimp park and near the SOTech plant. While in treatment at the WLA VA hospital, Darrell joined the VIPER program while transitioning from the domiciliary to supported housing and finally showing his strength and vision Darrel achieved his own apartment and car. Not only did Darrell power through his own issues, but he led his fellow vets in the program and inspired them with his tremendous heart. Drawing from his leadership experience as a Navy Boatswain’s Mate, Darrel organized his team to contact California legislators to urge support for the single use plastic bag ban. Darrel was supremely honored to be one of three VIPER vets featured in a recent Los Angeles Times article. In tragic irony, Darrel was quoted in the article saying that his greatest fear while living under the bridge was dying unknown on the street. Darrel’s story was told – first in the Times, and then it was reprinted in Star and Stripes to his brothers. In his last week, Darrel’s face carried a glow of pride. VIPER’s director, Jim Cragg coordinated with Good Year who generously offered to fly Darrell and his team in the blimp above the area where he had lived on the street. On Friday of that week, Darrell proudly presented Jim a report on the legislative phone calls his team had completed when Jim told him of Good Year’s promise. Darrel couldn’t have been prouder, commenting on the wonder of having lived on that street and the chance to fly over it in the blimp. Not having a watch, Darrell said he had marked the beginning and end of his days by watching the blimp take off and later be secured. According to his team mates, Darrell with his new found self esteem intended to confront his abusive girlfriend. At some point between his conversation with Mr. Cragg and 2:45AM, Darrell Rolen was stabbed in the heart and his girlfriend was arrested on the scene by the LA County Sheriff’s Department. 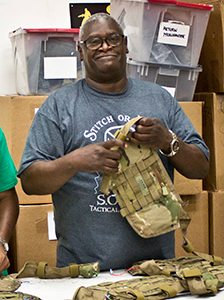 In a final testament to the great things that this once homeless man had done, Darrell spent his last month working at SOTECH assembling thousands of IED sensor harnesses that will measure the blast wave affects that cause Traumatic Brain Injury. These harnesses will not only help the thousands of soldiers going downrange wearing them, but the metrics analyzed from these devices will hopefully help treat the thousands of veterans out there who suffered from TBI from the last decade of war. 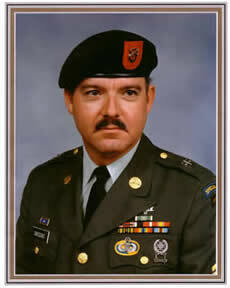 Darrell was buried in the Riverside National Cemetery on Wednesday September 19th 2012. Read more about Darrell in these articles and Posts: http://www.presstelegram.com/breakingnews/ci_21557782/carson-veteran-found-stabbed-death-had-kicked-drugs"
There is another hole in the ranks at S.O.Tech. An ever present smile, an uplifting sense of humor and the touch of a true craftsman. For over a decade, Chuy’s blade cut sheets that became the gear that protected and supported soldiers, sailors, airmen, marines and officers of the law. His crafted pieces saw service from the streets of our cities to far away battlefields. He left an impact on the world’s warriors, and he left an impact on our family. It was Chuy’s sweat that built our company, and we stood by him as he fought the disease. A great craftsman and a good friend, he will be missed.